Packed with some of the most famous sights in Japan, Kyoto is a must-see city on everyone’s itinerary, but if you only have a couple of days it can be hard to know where to start. Luckily we have the perfect plan to make it all happen! 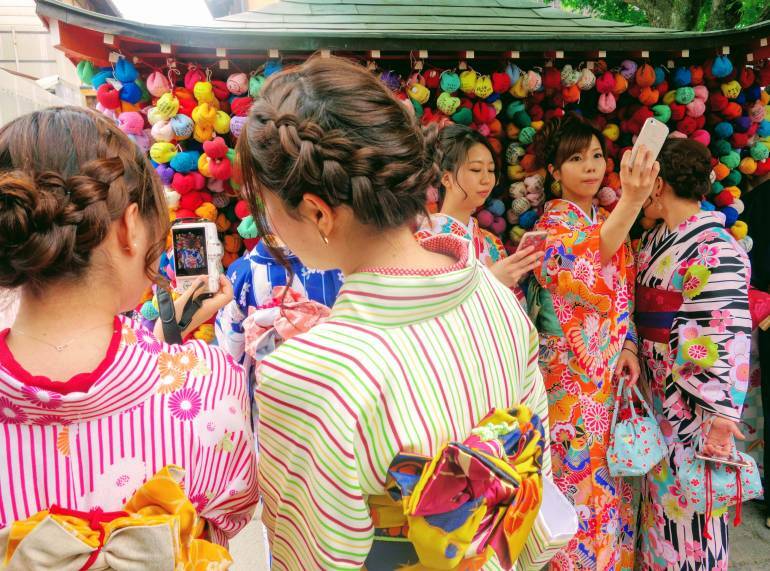 If you’ve read the first half of this Kyoto weekend itinerary already, you’ll know to expect quite a packed schedule with plenty of famous sights squeezed into your day. 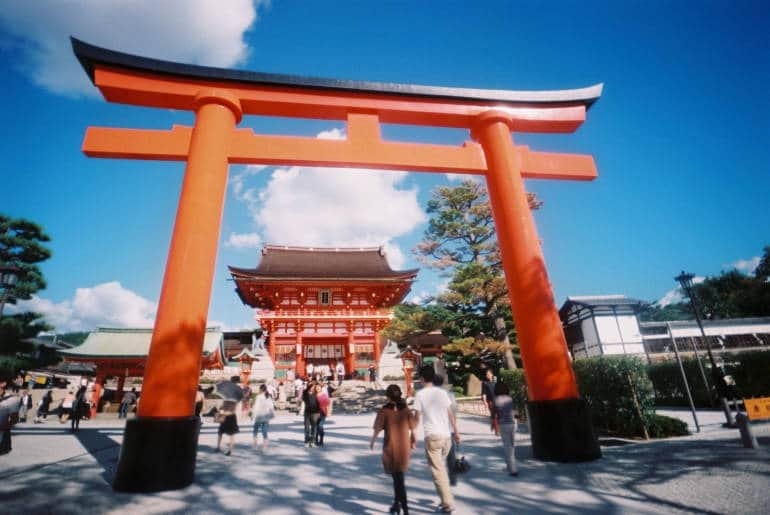 This second half is focusing on the east side of Kyoto, starting you off at the famous Nishiki Market and ending up at the even more famous Fushimi Inari Taisha. You’ll need comfortable shoes, some change for the train and not much else for this adventure, but be sure to keep an eye on the time, as it’s easy to lose track of it when wandering the beautiful streets of the city. 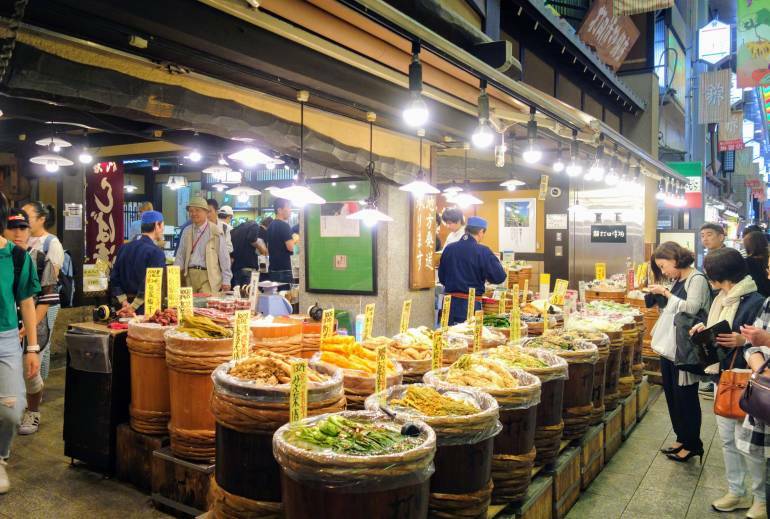 A narrow street filled with countless stalls and shops selling the best of Kyoto’s produce, Nishiki Market is nicknamed Kyoto’s kitchen. Open from 9am, the market quickly becomes a bustling hub of activity and there’s plenty to try and even more to take home. With everything from quail-egg-stuffed squid to steamed dumplings to mochi and more, there’s plenty to fill up on here as well as snacks to keep you going throughout the day. If you’re in the market for some souvenirs (see what I did there?) then look no further, they have great food gifts as well as kitchen items like world-class knives and personalized chopsticks. From the market, it’s an easy few minutes’ walk across the river to Yasaka Shrine, which is also known as Gion Shrine, nestled between there and Higashiyama. There are often weddings here so it’s a great chance to see the traditional ceremony and procession (from a considerate distance of course). 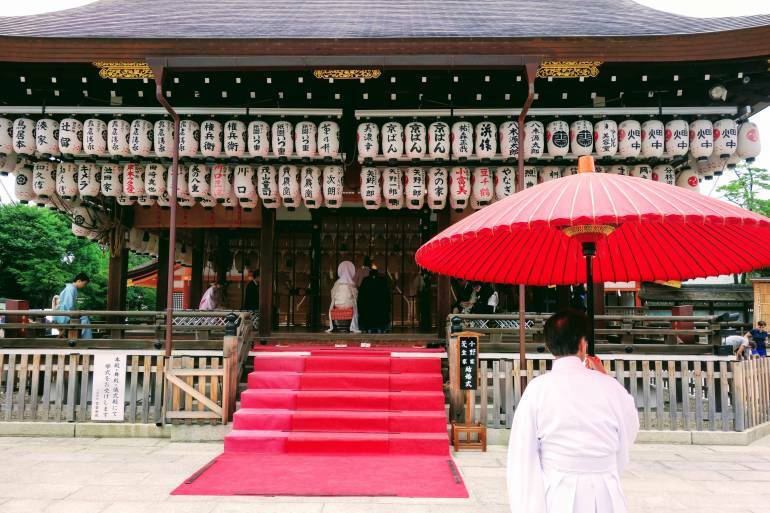 The shrine was founded over 1300 years ago and is home to the hugely popular Gion festival held every July. The surrounding Matsuyama Park is also a great cherry blossom spot in spring. 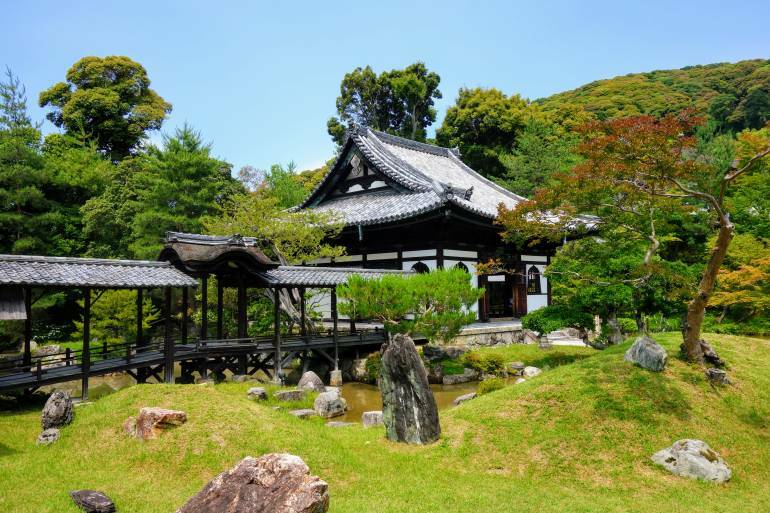 Within the park you can find Shoren-in Temple, a Tendai-sect temple with a close relationship to the Imperial family. As part of the Monzeki temple group, the head priests were traditionally members of the royal family, and this link dates back to the 12th century. Head out from Matusyama Park’s south exit and follow the streets signs for Kodaiji, as you will find the delightful Rakusho along the way. 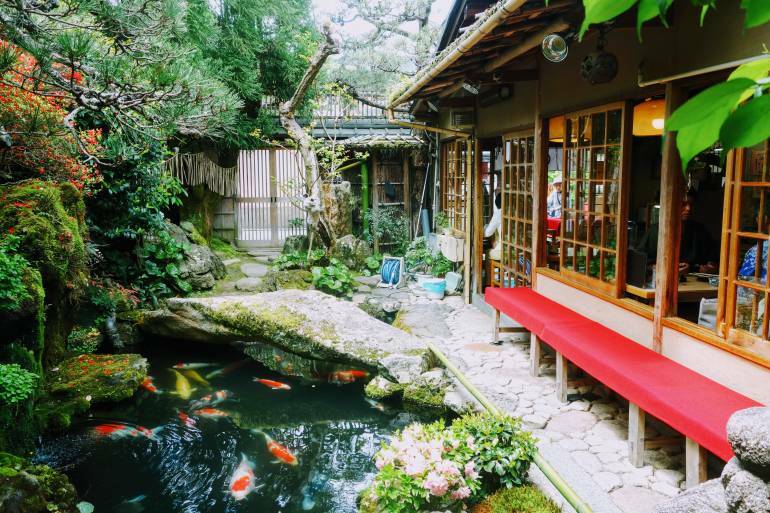 A small and very traditional tea house with tatami seating and a beautiful garden, this is a great spot for a tea break. Kyoto is famous for its matcha (green tea), and here you can try it prepared properly, with the in-house specialty of warabimochi and enjoy the view. The tea house has no seating charge and reasonable prices—and is often reassuringly filled with Japanese people on day trips. Be sure to check out the garden and beautiful koi (along with the resident ducks) before you leave! One of the most worthwhile visits on your temple-run list, Kodaiji is part of the Rinzai sect of Zen Buddhism and has a stunning Zen garden. Established in 1606 and rebuilt after various instances of destruction, the temple’s main hall was once covered in gold and lacquer but the current version, re-built in 1912 is a much more spartan affair. The raked gravel of the garden represents the endless sea and Kaizendo (memorial hall) holds intricate statues of Hideyoshi and his wife Nene, who would pray for him there after the shrine was established in his memory. There is a small bamboo grove and tea house. 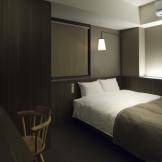 If you wish to enter the Entokuin nearby, you can get a combined ticket for 900 yen. 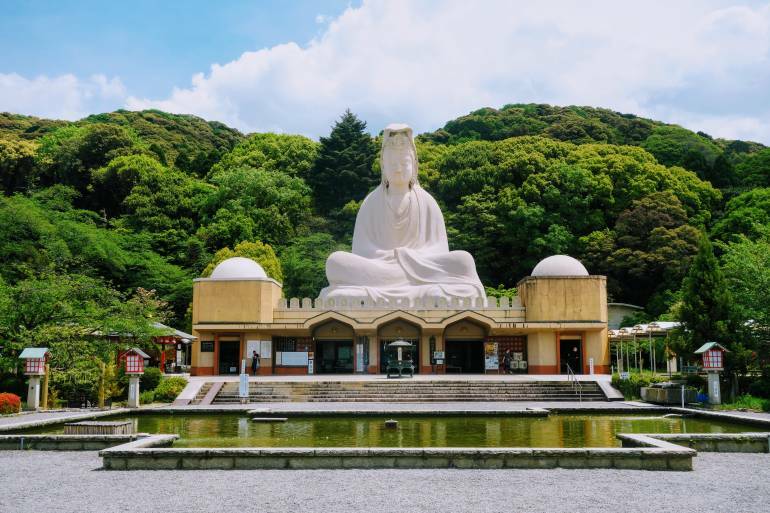 While exploring Kodaiji you may have seen the white head of the 24m-tall Goddess of Mercy in the distance. Built in 1955, the statue is a memorial to those lost in the Second World War and a reminder of the futility of war. You can enter the body of the Goddess to see the 11-headed image of the goddess enshrined within. Included in the 300-yen entrance fee is an incense stick you can place in the pot before the Goddess just beyond the Kagami-ike Pond. There is a small shrine for miscarried fetuses as well as a memorial to the unknown soldiers of the war and a wishing stone. When strolling through the narrow streets of the area, there are plenty of stunning sight to look out for. 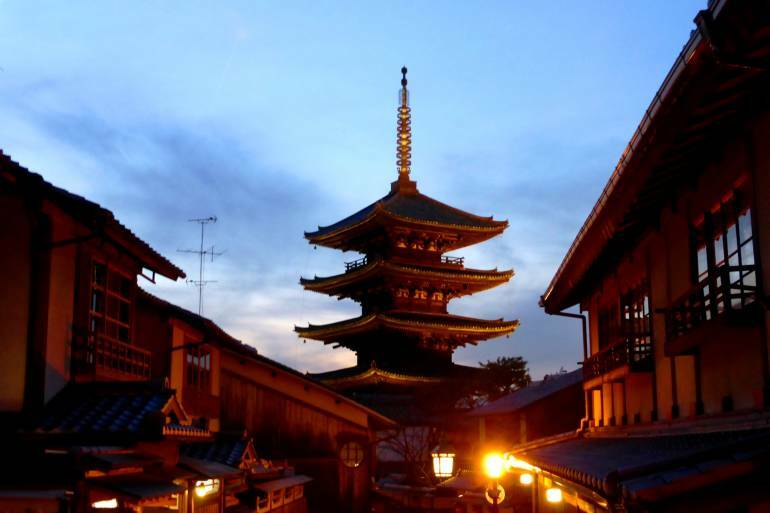 We suggest turning right when you reach the end of the street after the Kannon, and taking the second left after that, so you can approach the pagoda for one of the most famous views in Kyoto. (The spot to look for on the map is handily in front of Arabica cafe—which is great if you need a caffeine-boost). The pagoda itself is part of Hokanji Temple and is known as Yasaka Pagoda, with the option to enter the pagoda for views of the area. Next door is the brightly colored and much instagrammed temple called the Daikoku-san Kongo-ji Koshin-do, or the Yasaka Koshindo for short. Dedicated to the guardian warrior Shomen Kongo and to the three wise monkeys, the shrine is adorned with hundreds of bright kukurizaru. These small fabric balls which represent monkeys with bound hands and feet – thought to symbolise the control of the playful desire within. If you have a wish, you can sacrifice a desire and place it within a monkey—then they spirits of the shrine will help you. 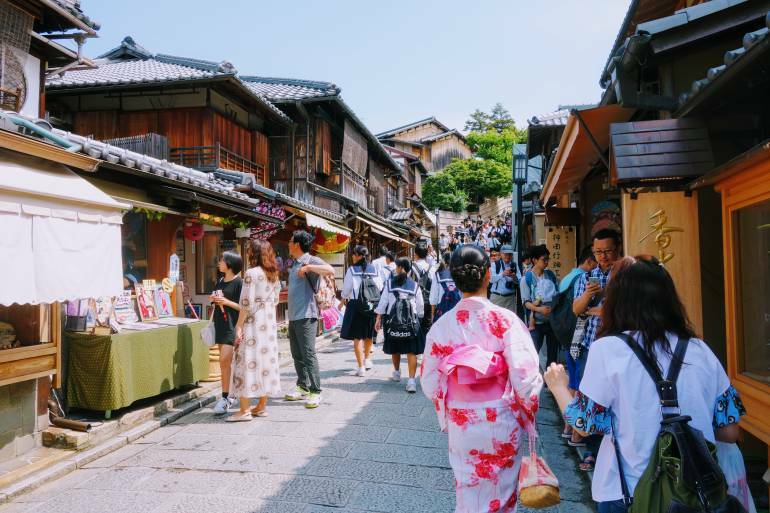 After touring the streets for snacks and souvenirs, follow the signs for Ninnen-zaka—the beautifully restored street that leads to Kiyomizudera. 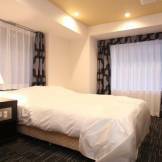 Paired with Sannen-zaka, the street is filled with traditional stores and tea houses as well as restaurants—all maintained to preserve the atmosphere of pre-modern Kyoto. Take your time, pick up some street food along the way and be sure to try plenty of sweet samples as you get closer to Kiyomizudera. This is a great place to grab lunch if you’re peckish, with tofu and soba being the most popular options in summer, and warming curry in the winter. A strong contender for most popular spot in Kyoto, Kiyomizudera is always busy, but don’t let that put you off. The name translates as “Temple of Pure Water” the rushing Otowa Waterfall is the heart of the shrine. 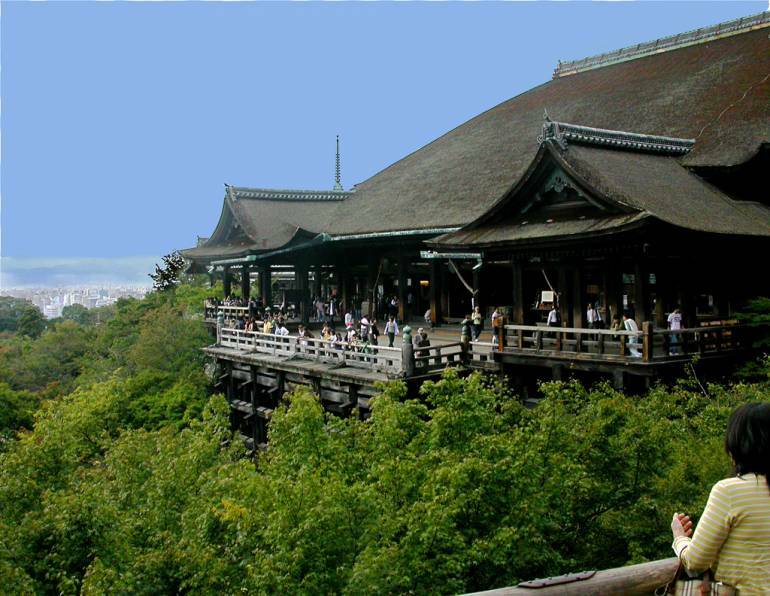 Dating back to 780, the temple is well known for the stage, a balcony which leans out into the surrounding forests and offers beautiful views of Kyoto. Unfortunately, the roof is under construction until 2020—but you can still enter the hall. Be sure to visit Jishu Shrine, located within the grounds, if you are looking for hope in your love life. The shrine is dedicated to matchmaking with love stones set 18m apart. If you can navigate your way between them with closed eyes, you will have good fortune in love. Once you’ve admired the view and blessed your love life, take a stroll back down to Kiyomizu-gojo Station, (about 15 minutes) and catch a train heading for Yodoyabashi on the Keihan Main line. The journey takes 7 minutes and costs 210 yen—trains run every 10 minutes so don’t worry about rushing for them. 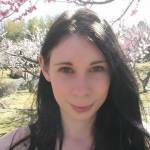 You’ll be getting off at Fushimiinari! 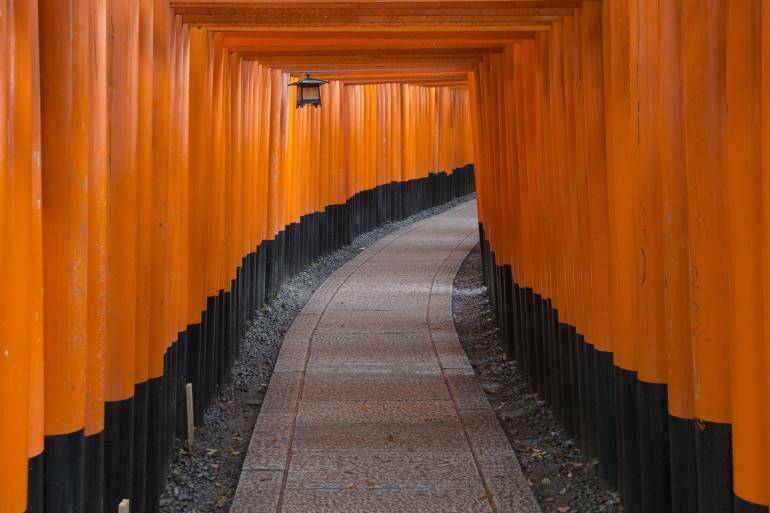 Saving one of the best ’til last, Fushimi Inari is world famous for its tunnels of red gates leading up the sacred Mount Inari. With literally thousands of vermilion gates, the route is stunning, and continues for a good 2-3-hour hike—which you can attempt if you’re feeling energetic. Before you do though, I suggest you fill up on street food if you’re feeling peckish. The stalls are often closed by 5pm so make sure you try the local specialty of grilled tofu and Inari sushi, a rice ball wrapped in sweet tofu. Feel free to explore the main shrine, with the gate built in the 16th century before you head up the trail. The great thing about the path is that you needn’t continue all the way up, you can walk as far up as you can, and then turn around and come back. There is only one split section which is controlled for up and down, and that is near the start—with very densely layered gates making excellent photo ops! 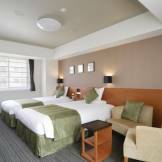 And there you have it, a jam-packed Kyoto weekend itinerary. Now you can head off on the Shinkansen to your next destination knowing you have seen all of the bets spots in the ancient capital! If you have a third day, why not head to the Silver Pavilion and enjoy the Philosophers’s Walk? There’s also the Manga Museum and the Imperial Palace to see, not to mention the 1980 other shrines and temples in the city! For transportation ideas, read our guide on the fastest and cheapest ways from Tokyo to Kyoto.